A 2 minute stroll from the cottage where I live takes you into a woodland wonderland. Either side of the stream, ancient oaks stand sentinel on gentle slopes and provide a haven for the many different species of birds that provide a soundscape of song the whole year round. 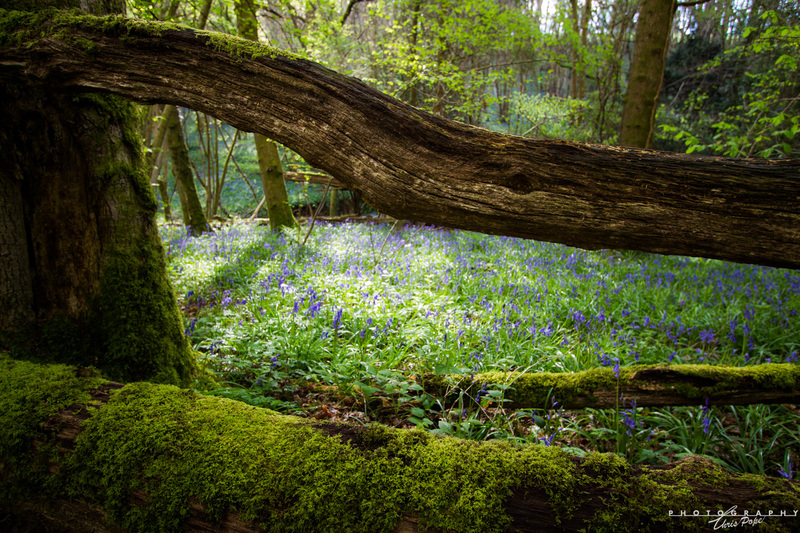 During April however, a transformation occurs on the forest floor as a carpet of green erupts into the most amazing sea of blue and white thanks to an abundance of English bluebells, wood anemones and wild garlic. I say blue and white but one of the things I find most mesmerising about bluebells is trying to define their colour. I’m not talking about the Spanish interlopers with their horrible overly tall stems, lack of distinctive shepherd’s crook necks and variable hues, I’m talking about the actual colour of a true English bluebell. We all know that colours look different in context and in different light but seriously, there’s something about a bluebell which can have it’s colour seemingly morph and fluctuate before your very eyes. It also makes it a challenge at times to capture this in a photograph. I’d taken numerous shots where I’d review the results only to delete them because they just didn’t do justice to everything my eye was seeing. The fact is, all too often when we mentally frame a shot in a wider visual context, the finished result misses the additional information collected by your eyes and processed by your brain. Add a natural frame into the equation and it’s a very different experience, which is what happened in this shot. I across this wonderful view and immediately was drawn to the moss covered logs in the immediate foreground and the partially moss covered tree slightly further into the frame, which together provided the most natural frame through which to view a patch of bluebells swaying in the breeze in dappled sunlight. I also loved the contrast of the colour of the mossy green with it’s yellow hues compared to the green of the bluebell leaves in the centre of the shot. The icing on the cake for me personally was the branch which cuts across from top left to middle right with its smattering of moss top left and the light, almost silvery sheen of the damp surface. Everything works to draw mask the wider woods and draw your eye through the natural frame to the bluebells beyond.